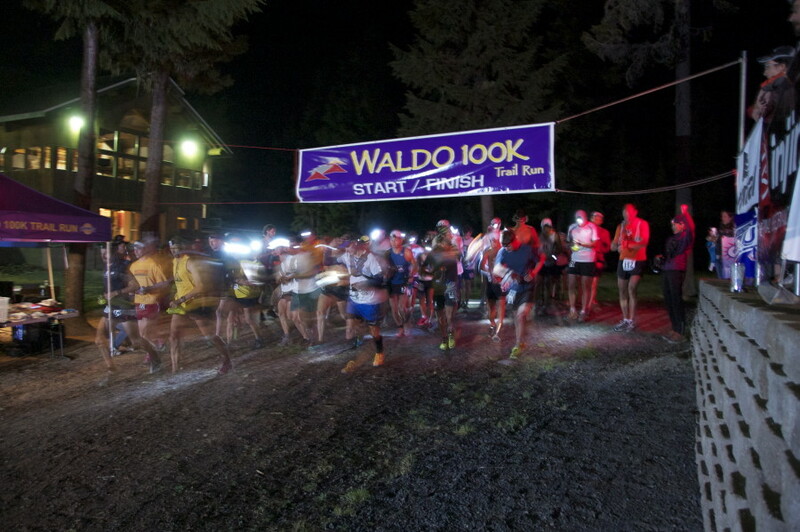 We put Waldo on so runners can challenge themselves. So they can run on miles and miles of single track through beautiful Oregon forests, past scores of alpine lakes, by millions of mountain hemlock fir trees, to the tops of several former fire lookout peaks with incredible views of pristine Waldo Lake. We pride ourselves on top-notch aid stations with helpful, enthusiastic, and passionate volunteers; on our medical, search and rescue, and communication infrastructure to track and care for runners; and on our concern for the well-being of every single runner—whether they finish in 9 hours or 20 hours—with hot food and cold drinks waiting for them at the finish. Waldo is definitely all about the runners. When race management got a call on Wednesday evening before the race from the US Forest Service (FS) that the new “Bobby Fire” had been discovered smack dab in the middle of the race course—in a place that runners go by twice—our immediate reaction was empathy for all the runners who would be disappointed if we had to cancel. Yet, with very little information available to share, we notified runners of the fire and that either a cancellation or reroute were possibilities. Fires are notoriously unpredictable, and they are the one thing that will shut a race down regardless of the actions of race management. If the Bobby Fire was not knocked down immediately there would be no Waldo this year, no matter our efforts. On Thursday, the firefighters fought the fire “fast and hard,” holding it to just 11 acres. That’s a tiny fire, we thought. Surely we can run around it. 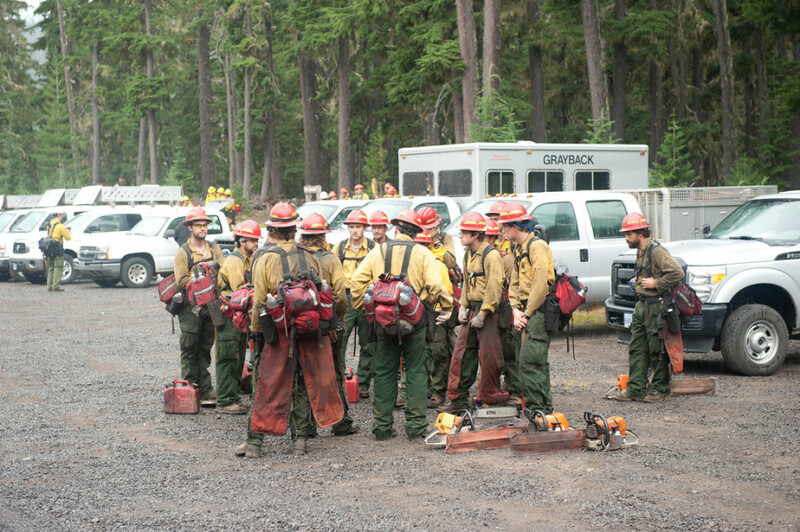 Working closely with the FS we proposed a reroute, which they agreed with in principle as long as the fire remained small, and we were able to control access so no runners would wander into the fire area where the 100 or so firefighters were working. They told us they would let us know of their decision by noon on Friday, 15 hours before the early start. Some runners decided not to travel to the race. That was entirely understandable. At 11:15am Friday, after another morning of great firefighting efforts with no expansion of the fire, the FS agreed to let us use our proposed alternate route. The race was on, albeit with three added bonus miles ironically returning it close in distance to the original Waldo course that was used the first five years of the race. And what a race we had. Young Jake Rydman from California came to Waldo wanting to win a golden ticket to Western States (WS). 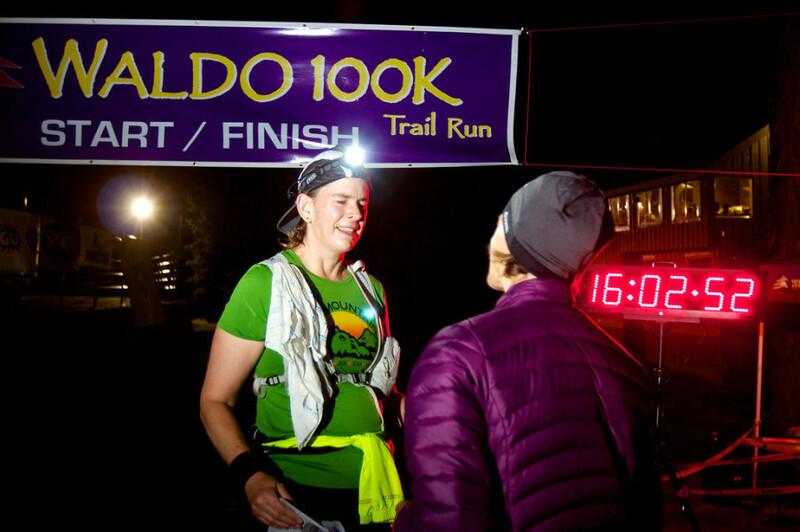 Since Waldo was yet again the first race in the 2012-2013 Montrail Ultra Cup series, the first two men and women would earn WS spots, with a spot rolling down to third if either first or second was already in. With a who’s who list of Oregonian runners in the field, including Hal Koerner, Timothy Olson, Ian Sharman, Joe Uhan—most of whom already had their WS spots secured—the prudent strategy for Jake might have been to race for third. But that is not what Jake did. He ran to the front from the beginning. He was the first to summit Fuji, which earned him the “Find Waldo” prize. He was the first to reach Charlton Lake, the “halfway” point where runners can pick up their pacers. Some might have thought it was reckless and foolish, but he continued leading to the summit of Maiden Peak which, due to the reroute, required an almost 3000’ climb starting at mile 50 from Gold Lake at 4900’, the lowest point on the course, to 7800’, the highest point. 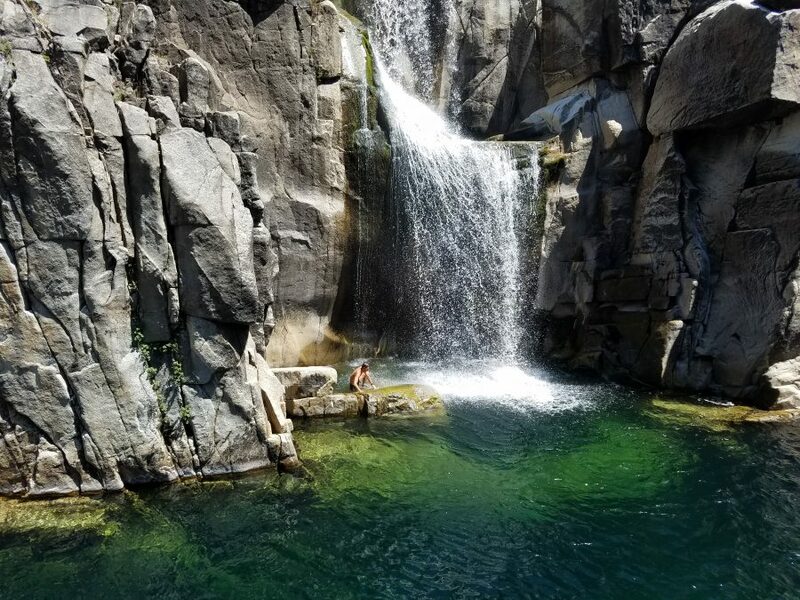 It wasn’t until the descent off Maiden on the re-claimed trail we dub “Leap of Faith” that Timothy Olson, current WS champion and record-holder, finally caught Jake. After a friendly exchange Timothy was gone. He won the race in 9:52, about 45 minutes off Dave Mackey’s course record, but on a longer and arguably more difficult course. Upon finishing, just four minutes behind Timothy, Jake immediately lay down on the gravel with a mix of exhaustion and exuberance evident on his face. In a show of solidarity, Timothy joined Jake on the ground, and they both remained sprawled out face up for many minutes. With one WS spot still up for grabs for the men, it would come down to the race for third. Yassine Diboun from Portland and Jesse Haynes from California had run/hiked up Maiden together after being close all day, but Jesse gapped Yassine on the descent down Leap of Faith. They stayed that way to the end—despite Yassine blowing past the last aid station at Maiden Lake in hot pursuit—with only four minutes separating the two at the finish. The women’s race was between three awesome fast ladies, each of whom would finish in the top ten overall. Early leader Alison Bryant, a mountain runner and Waldo veteran from North Carolina was in front or close to the front all day. She was the first to summit Fuji (and win some swag) with Waldo course record holder Joelle Vaught right on her heels. By halfway Joelle had a slight four minute advantage over Alison. Montrail Ultra Cup champion Denise Bourassa was patient early, and caught Alison by the second visit of the Twins (43.1 miles). She was also gaining on Joelle, but couldn’t quite reel her in. Race day was not without incident. Around 6:00pm a narrow band of thunderstorms headed our way. At 6:09pm we made the call to pull the Maiden Peak summit monitors down to the Leap of Faith junction, a ¼ mile below the summit. The remaining runners would head straight down, foregoing the summit. This was a scenario we had considered in previous years, but never had to implement. Suffice to say that the runners who didn’t get to summit still got way plenty of extra miles. Waldo has some wacky awards including the “Wet Waldo”, which involves completely submerging in up to six named lakes. This year it was a close contest between Co Jones and Todd Temple who both claimed to have swum in all six lakes. It was later discovered that Co didn’t quite make it to Found Lake, but instead tried to submerge himself in eight inches of swampy muck just north of the lake. We gave him a red Moeben skirt for his efforts. The “Show Us Your Waldo” award went to long-time co-aid station captain Melissa Berman who sang a Lady Gaga parody titled “Bad Waldo” at each of the nine aid stations. By our estimation, it had to have added at least 20 minutes to her finish time. Waldo is never going to be a big race. Not only because of the 125 runner limit specified in our permit, but also because of our three remote aid stations that require 1.5, 2.5, and 3.0 mile hike-ins. Nobody in their right mind designs a course with three (well, four because the Twins is visited twice) remote aid stations, but that is what we have at Waldo. Putting this race on requires lots of volunteers. Volunteers willing to put a five-gallon jug of water on their backs and hike it in. All 175 of them waited just like the runners for the final go/no-go. And they came with their A-game, many going above and beyond like the Gold Lake aid station which, instead of being open from 4:30am to 7:00am, remained open an additional 12 hours so runners would get aid at mile 50 before tackling the last big climb of the race. One of the most enjoyable things about Waldo for me is hanging out waiting for the last finishers to come in. Mostly I’m amazed at the surprising number of folks who hang out late into the night to cheer in those last runners. Because of the lengthened course we waited until 12:55 am, a new DFL record, to welcome Eva Casale, our last finisher who had travelled to Oregon from New York. And, like every other Waldo finisher, she was greeted with cheers, hot food, and a cold drink. Another great Waldo! Still one of the best races around. Congrats, Eva!